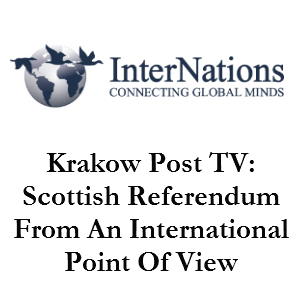 With the referendum on Scottish independence looming, Krakow Post TV went along to the InterNations meeting in Krakow to get an international perspective on the issue of whether the Scots should break away from the United Kingdom. The InterNations gathering took place on the C.C. Stefan Batory – a floating restaurant and conference centre on the Vistula River on August 28. As always, people from many different nations currently living in Krakow were there to socialise and make new connections. The Krakow Post’s Managing Director, David McGirr – himself a Scot and a firm supporter of Scottish independence – asked a few of those assembled about their views. You can find out more about historical Polish/Scottish links in our feature Scots in Poland, Poles in Scotland. You also can check the YES Krakow Facebook group to find out more about the referendum. That Evan fella can hand back his Irish Passport. To all those eligible to vote on 18 September… Just say No, folks! Independence is a recipe for bigotry and intolerance. How very wrong you are. A NO vote would leave the Scots with the real risk of a coalition government in 2015 with UKIP either part of the coalition or with a greater representation at Westminster. UKIP, arguably one of the most bigoted and intolerant parties in the UK at the moment are in the ascendancy in England yet were chased out of Scotland. Please explain why an Independent Scotland would suddenly become bigoted and intolerant. You offend and do a disservice to a couple of million Scots. Scots and the Scottish government positively encourage immigration and ‘New Scots’ the same is not true of England, yet I would never stop to your level and accuse England of being bigoted and intolerant. as I know that this only applies to some. To vote NO is a fair and democratic choice for any of the 4 plus million Scots eligible to vote. There may be for those people many reasons that they have made their choice, but certainly not fear of a bigoted and intolerant Scotland. You do not understand Scotland, it;s politics or it’s people. Is the association of independence = intolerance and bigotry a general one or one which you associate, with your own bigotry only to Scotland ? If you would like yo educate yourself on bigotry and intolerance, read this . To all those eligible to vote on 18th September make the right choice for you and for the future of your family and for Scotland.Whatever that may be. I know for me that choice is YES for a fair democratic and socially just Scotland. Vote NO for the poison of bigotry and intolerance to creep North across the border led by the coalition government. So just suppose Scotland opts for independence. So what currency will we use? We’re less than a fortnight away from the referendum and Soapy Salmond is unable to answer that question. Less than a fortnight away and he isn’t prepared to share what his Plan B is for life without the pound. Soapy Salmond says that independent Scotland will automatically become a member of the European Union, but that’s not what the EU is saying. As stated earlier – just say a resounding No! EU membership will be negotiated between the Scottish government and the EU. I think a former President of the EU may be more reliable a source on this subject. Still it is all just opinion at this stage. But do you seriously think the EU will bar Scotland from the EU? Intolerant and Bigoted you say Sean ? More like tolerant, welcoming, inclusive and International. Looks to me very much like the NO campaign have imploded, Gordon Brown making sweeping promises he has no power, to deliver. He is a former PM and now a backbencher for the Opposition, so where, pray tell, will he suddenly get the ability to deliver his false promises? Devo max – an option that Westminster insisted was a red line issue and would not be an option, but now is a ‘radical’ new proposal ! Get real! David, you’ve watched Braveheart more times than is sensible for anyone. All I’ve heard from the Yes camp is that everyone is going to be better off. Young people. Old people. Families. Workers. Unemployed. Where is the funding for all the promises to come from? No mention of having to raise taxes to cover this state largesse. So where’s the funding to come from? If you’re thinking of revenue from North Sea Oil, well think again. The revenues from oil are dwindling. And we can only sell so much whisky and Tunnock’s Tea Cakes to the world. The majority of working people in Scotland work in the public sector. That’s local government and the NHS. All doing vital jobs, for sure, but not exactly generating wealth. It wasn’t so long ago that Soapy Salmond was extolling the virtues of Iceland and Ireland as prime examples of small countries punching well above their weight financially. Then shortly afterwards both countries were effectively bankrupt and taking bailouts from the EU. That’s why I have so little faith in Soapy Salmond. I know that he’s lying because I can see his lips moving. And have you ever wondered what would have happened had Scotland been independent when Bank of Scotland and the Royal Bank of Scotland went belly up? And Soapy Salmond is so desperate for votes that he extended the vote to 16-year-olds. Pitiful! Time for you to wake up and smell the coffee, David. Funny how only the NO campaign cast up Braveheart, Bannockburn and remind everyone about how patriotic they are. This is about Scotland’s future, not the past. Pity you and your like are too small minded to appreciate and understand that simple fact. Funding – Read the white paper, ask a primary 7 kid of your acquaintance to help you with the sums. Oh dear, Oil, whisky and tea cakes, the language of a Daily Mail reading No troll. Too wee , too poor – yep – expected that one, there are no small nations on this list then ? You really need to get back to the Daily Fail, watch some more BiasedBC and read Darlings fables, as you really are letting the side down. There are so many of the fear factor top ten you omitted to mention, poor show. Anyway, too busy campaigning for a socially just, free, tolerant, prosperous and democratic Scotland to waste any more time on a NO troll. Keep up the pathetic work. At least you haven’t abandoned the sinking ship, yet. Looking forward to the 19th – Suggest you go off and try to find a talking book version of the White Paper, so you can get your head round Scotland’s future. Off to campaign some more, too busy between now and the 18th to bother reading any more of this NO nonsense. Hi David. No, I’m not a troll. Just someone living in Scotland for almost 15 years now who has just as much a right to an opinion on this issue as you. Funny how the pro Independence camp just love to launch vitriolic attacks on anyone who disagrees with their stance. The funny thing is that you just don’t see how bitter and intolerant you really are. The more you say the more bigoted you appear. Are you Soapy Salmond’s wee bairn or nephew perhaps? No doubt David hasn’t looked here recently otherwise my comments would have vanished. It seems it is more or less impossible to have a rational discussion with any Nationalist on independence. My points would have been purely practical ones – for example, what currency will you use? The SNP has had years to plan for independence yet either cannot or will not answer such basic questions. I fell out with David by asking him about Europe and independence. According to the Kraków Post editor, Farage should be (his words) run out of town if he ever came to Scotland! And this guy is a former policeman, So much for free speech. David wants independence from the United Kingdom, but apparently wanting independence from a United Europe is some extreme form of fascism. Fortunately and thankfully David and his chums lost. If they hadn’t behaved so utterly boorishly and unpleasantly I might have some sympathy, but as they have been complete cunts over some considerable period I believe it appropriate to laugh in the faces of this vile bunch of jumped-up little fascist turds. Poor old David has nothing to say. Pride before a fall. Wonder if this has taught him anything at all? What strikes me about David’s tone is the self-righteousness and utter conviction. He, and those who think like him, believe they alone know the truth. He, and those who think like him, speak for all. I suppose he has been the spokesperson in Scotland for the misguided, misinformed and the very young, but that’s as far as it goes. If any good has come from this Scottish independence debacle, it’s that the likes of David should keep their big mouths shut and their ignorant opinions to themselves for some considerable period of time.